foundation that can withstand the weight and absorb vibration is essential. Reinforced concrete slabs with runners provide for placing and anchoring the boiler. The runners should provide a level, uniform support and be of sufficient height to allow for maintenance and the installation of piping under the boiler. A raised platform also provides easier access for boiler room cleanup. Generally, a sump in the slab between the runners provides a catchment area for boiler blowdown or draining of the boiler. This sump drains from the building to a suitable dispersal point. When considering the requirements of sheltering a boiler, you must ensure there is enough room for the boiler and all of the accessory equipment. This accessory equipment may include condensate tanks and pumps, chemical feeders, water makeup tanks and feeders, and blowdown tanks. The boiler room must also be large enough to allow for boiler maintenance, for retubing, and for removing and replacing the boiler. The tube length of a boiler maybe from 2 feet 6 inches to at least 10 feet, and possibly longer. To simplify the removal of the tubes, ensure the boiler room is long enough or have a door located behind the boiler. The most important thing to check is the manufacturer's specifications, which provides the proper dimensions for locating the boiler. Fresh air inlets and louvers allow fresh air to enter and move across the boiler area. This fresh air entering the boiler room removes excess heat and provides adequate makeup air for combustion. When planning for boiler room construction, you must always consider boiler requirements, maintenance requirements, and manufacturer's recommendations. 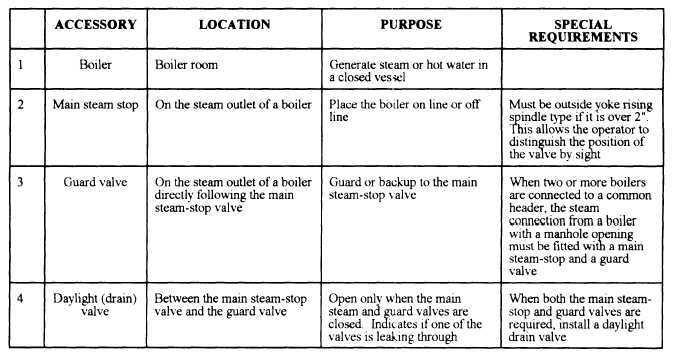 As you review table 12-1, open the fold out figure 12-1 on page 12-5 for identification of the boiler accessory equipment.